The final area of oral health that your dentist evaluates is dentofacial, which examines smile characteristics and how your teeth look in your face. Kois-trained dentists understand this is the starting point for all esthetic dentistry. Your dentist has been trained to understand the elements that are necessary for a beautiful and healthy smile. Your risk is determined by how much your front teeth show in your happiest smile, the size and shape of the teeth, and their color. Your dentofacial risk is determined by all these components. The dentofacial diagnosis helps you and your dentist select the appropriate treatment for your individual esthetic needs. Understanding a person’s dentofacial risk makes natural-looking, esthetic results more predictable. The materials that your dentist uses depend on how much tooth and gum are displayed when you smile. Smiles that “show everything” require materials that have a higher esthetic value but may not be the strongest. Those who show less may be able to use a material that is stronger with less need for cosmetic value. Many other decisions are also based on your dentofacial risk: Do the teeth need to first be moved into the right place so that conservative veneers are an option? Is tooth whitening alone enough? Is cosmetic gum surgery needed? Should the front teeth be longer or shorter? Predictably improving a smile—and therefore reducing dentofacial risk—requires understanding where the teeth must be positioned in the face, how the teeth should be shaped for visual harmony, and if gum tissue contributes to the unfavorable appearance. necessary, although in some cases teeth may be restored esthetically to appear in better alignment. Creating harmony and balance between teeth and gum tissue on both sides may necessitate gum tissue alterations. 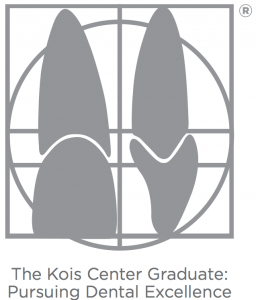 Your dentist’s training at the Kois Center and understanding of facial esthetics assures that you will receive the most predictable esthetic treatment options available, whether you seek a more youthful smile, cosmetic dentures, or the rebuilding of worn-down teeth.